Sports Illustrated has long documented Ichiro's rise through Major League Baseball. Take a look back at SI's best coverage. Ichiro retired from the MLB on Thursday, exiting in the eighth inning against the A's in his final appearance in uniform. The 10-time All-Star ends his career as one of the most celebrated players of all-time, with a host of accolades and statistical accomplishments worthy of enshrinement in Cooperstown. Sports Illustrated covered Ichiro's career extensively since 2000, with a slate of writers detailing his extensive preparation, unparalleled skill and underrated competitiveness. Check out the best of SI's Ichiro content, including behind-the-scenes notes on one of the best hitters in MLB history. 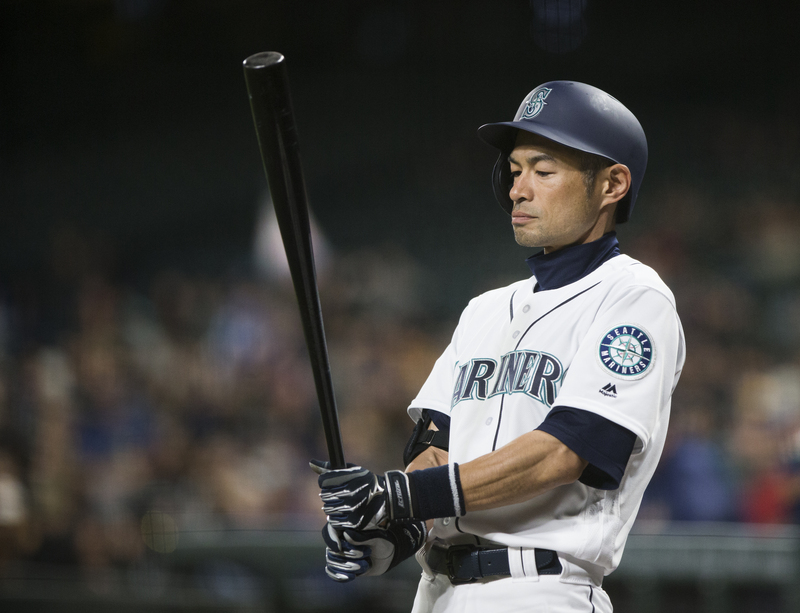 "The reaction in Japan to Ichiro's imminent departure has been a touching mixture of barely concealed pride and barely expressed sorrow, the emotions of a parent driving his only child off to college. There's no more reason for the Japanese to be angry with the 27-year-old Ichiro for leaving than there is for a father to be angry with his son for growing up. Japan has been on a first-name basis with Ichiro for years--he dropped his last name, Suzuki, in 1994, the year he had a Japanese Leagues-record 210 hits--and his signing of a three-year contract with the Mariners, reportedly for between $15 and 18 million, has been treated as if it were a family matter. He's the special son, the perennial leader in the All-Star balloting, a cottage industry of endorsements, a player so admired that the yellow Nike Air Max '95 model sneakers he favored touched off a minor wave of Air Jordanesque shoe-jackings (oi hagi) by roving gangs in nearby Osaka." "The Mariners' biggest addition is rightfielder Ichiro Suzuki, the slap-hitting batting champion from Japan who attracted about 100 media members to his first official workout. The Mariners expect his adaptation to America to be as smooth as that of Sasaki, the 2000 Rookie of the Year closer. Indeed, Ichiro, as Suzuki is universally known in Japan, declined a team offer for a translator while learning the kind of clubhouse idioms you won't find on a Berlitz tape. 'Jay's teaching him the King's English, and Paniagua's teaching him the King's Spanish,' manager Lou Piniella says with a howl of laughter." "In the spring of '99, when Suzuki spent a few days at Seattle's training camp, Ken Griffey Jr., a Mariner at the time, sized up Suzuki and proclaimed, "He's got no booty." Two years and an additional 15 pounds of muscle later, Suzuki is still relatively bootyless, prompting some to wonder how he'll hold up under the rigors of a 162-game schedule with frequent long-distance road trips." "Instead, Wilson and his teammates have marveled at Ichiro's one-of-a-kind approach. Between pitches in rightfield, Ichiro puts on a calisthenics clinic. If he's not rolling his shoulders, he's stretching his quads. If he's not stretching his quads, he's bending at the waist and touching his toes. When he sits at his locker, Ichiro methodically rubs a six-inch wooden stick up and down the sides and the bottoms of his feet. "It's for pressure points," he says through an interpreter. "If your feet are healthy, you're healthy." In an effort to keep his vision sharp, Ichiro rarely watches television for extended periods without wearing sunglasses. Before every game a Mariners trainer gives him a massage. Hitting coach Don Baylor pointed out that even in the lowest depths of his slump, Ichiro wasn't exactly flirting with the dreaded Mendoza line of .200. "His Mendoza line," Baylor says, "is about .315." Also, Baylor sees no mechanical causes for Ichiro's decline. But there's been one obvious symptom of his recent struggles: Ichiro hasn't shown his normally remarkable bat control. Instead of flicking line drives to all fields and slapping hard grounders between infielders, he's been lifting more pop-ups and lazy fly balls than usual. Though he's deceptively powerful at 5' 9" and 172 pounds, Ichiro didn't become arguably the game's best pure hitter by hitting the ball in the air so often. "Ichiro's at bats are clinics in working over a pitcher: stretch, shirt tug, foul, foul, foul, flare to left center. With his maddening skill at making contact, it's nearly impossible to fire three pitches past Ichiro. When he dives after a curveball in the dirt, as Zito induces him to do in his first at bat, "I can't really pat myself on the back," Zito says. He figures Ichiro just made a rare mistake." "The singles hitter always will be played down in baseball, and there will always be the call for Ichiro to swing harder, to try to hit the home runs he has no trouble hitting in batting practice. Ah, but this is not the way he works. He builds his record with matchsticks, one base at a time. Want home runs? Take Ichiro Suzuki's record-setting base hit haul at the end of the season and divide by four. He went past 60 homers when he passed 240 hits. He just did it on the installment plan"
"In Ichiro's first month in the big leagues, he would hit .336. 'Overmatched,' you say? He was SI's cover star before May was through. He made the AL All-Star team, which he would go on to do each of the next nine seasons. By year's end he had amassed 242 hits—then the ninth-best single-season total in history, and the biggest total since 1930—and his .350/.381/.457 batting line, coupled with his effective patrolling of Safeco's expansive right field, won him the AL MVP and Rookie of the Year awards. (He and Boston's Fred Lynn remain the only men to win both honors in a single season, though a pedant might note that Ichiro actually ranked No. 4 in WAR among American Leaguers, behind, among others, his teammate Bret Boone.)"